KNOWN AS THE Palmetto State, South Carolina was named for Kings Charles I and Charles II of England. This small state, which was one of the 13 original colonies, covers an area that extends from the ATLANTIC OCEAN to the APPALACHIAN MOUNTAINS. South Carolina is bounded on the north by NORTH CAROLINA, on the east and southeast by the Atlantic Ocean, and on the west and southwest by GEORGIA. The Savannah River, shared by South Carolina and Georgia, makes up most of the western boundary of the state. The total area of South Carolina is 32,007 square mi (82,897 square km), and the state ranks 40th in size among the 50 states. It ranks 26th in population (4,107,183 people). South Carolina’s largest cities are Columbia (the capital), Charleston, North Charleston, Greenville, Rock Hill, Mount Pleasant, Spartanburg, Sumter, Hilton Head, and Florence. 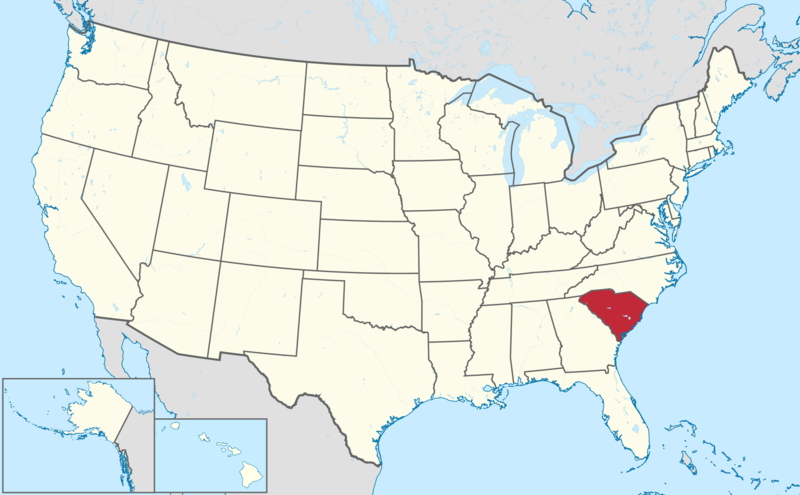 Water covers 1,896 square mi (4,911 square km) of South Carolina’s total area. South Carolina’s major rivers are the Pee Dee, the Santee, and the Savannah. While the state has no large natural lakes, a number of lakes have been created by dams. The largest of these lakes are Lake Greenwood, Lake Marion, Lake Moultrie, and Hartwell/Thurmond Lake, which is shared with Georgia. The highest elevation of 3,560 ft (1,085 m) in South Carolina is Mount Sassafras, and the lowest elevation is where the land runs into the Atlantic Ocean (0 m). Most of South Carolina enjoys a subtropical climate. In the Blue Ridge section, however, the climate is humid continental. Temperatures generally range from around 50 degrees F (10 degrees C) in the winter to around 80 degrees F (27 degrees C) in the summer. South Carolina experiences an annual rainfall of 45 in (114 cm). While rain falls throughout the year, most of the state rarely sees snow. The coastal area experiences occasional hurricanes such as Hurricane Hugo, which devastated the area in September 1989. The rest of the state is subject to periodic tornadoes. South Carolina’s geography encompasses three distinct regions: the Atlantic Coastal Plain, which covers approximately two-thirds of the state, extending from the coast of the Atlantic Ocean for 70 mi (113 km) and containing highly fertile soils; the Piedmont Plateau, with elevations ranging from 400 to over 1,000 ft (122 to 305 m) above sea level; and the Blue Ridge Region, which contains South Carolina’s mountains that rarely exceed 3,000 ft (914 m) above sea level. A flat area within the Atlantic Coastal Plain that extends 70 mi (113 km) inland from the coast is called the Outer Coastal Plain. This area is filled with rivers and swamps. The state’s most fertile area is located in the rolling hills of the Inner Coastal Plain. The Fall Line is located in the area where the rivers of South Carolina’s upland descend into the region that South Carolinians call the lowlands. The Sea Islands of South Carolina are connected to the mainland by a number of salt marshes, lagoons, and sounds, and soils in this area tend to be light and sandy with foundations of clay and sand. The Pine Barrens, which are found in South Carolina’s midlands, are home to numerous species of wildlife. Sand hills make up the westernmost edge of the Atlantic Coastal Plain. The Piedmont, also known as the uplands, is made up of granite, slate, and gneiss. Hard rocks abound as the Piedmont gives way to the Blue Ridge Mountains. Within the Piedmont, elevations range from 400 to 1,200 ft (120 to 365 m) above sea level. Dominated by agriculture until the beginning of the 21st century, South Carolina’s economy is now chiefly shaped by commercial, financial, professional, and governmental industries such as the Savannah River Project, located near Aiken, South Carolina, and nearby Augusta, Georgia. Agriculture remains important to the state’s economy, and South Carolina ranks third in the UNITED STATES in the production of peaches and fourth in the country in tobacco production. Other farm products include soybeans, vegetables, corn, hay, watermelons, and peanuts. The state also produces chicken, turkey, and cattle. A tea plantation located on Wadmalaw Island is the only commercial tea plant in the United States. The asbestos, wood pulp, steel products, chemicals, machinery, and apparel industries located in Charleston are essential to the economy of the state. Textiles are produced throughout much of the state. The state flower of South Carolina is the yellow jasmine, the state tree is the palmetto, and the state bird is the Carolina wren. Approximately 60 percent of South Carolina is forested, most notably by several types of pine that include the longleaf, short leaf, slash, loblolly, and Virginia varieties. Oak, sweet gum, hickory, and magnolia are found in drained areas, while palmetto, cypress, tupelo, tulip trees, and sweet gum are located in South Carolina’s wetlands. Wildflowers include azalea, gentian, mountain laurel, and violets. South Carolina’s wild animals include white-tailed deer, opossum, rabbit, and raccoon. Several varieties of migratory birds, including water fowl, ducks, and geese, are frequently seen along South Carolina’s coast. Birds found throughout the state include the catbird, mockingbird, oriole, and the Carolina wren. South Carolina is the only gold-producing state east of the Mississippi River. Other minerals found within the state include vermiculite, sand, kaolin, gravel, stone, peat, mica, and gemstones.